This is our first review from Co_Foodie! Glad to have them on board! You can find some of their other reviews on Foodie Dreaming. 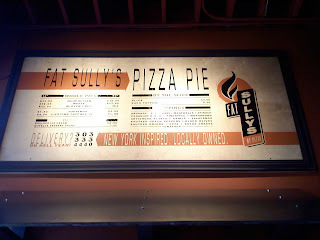 On June 30th, we went to check out Fat Sullys. This is an unassuming little pizza joint inside the Atomic Cowboy. It was also my first Denver Tastecasting event so I was very excited! As I entered, I found a bunch of board games and great music greeting me. I joined the group and introduced myself. There were cute little signs on the tables, each one looking like a Twitter posting. Hungus came out and gave us a little introduction to Fat Sullys and then their wares started parading from the ovens. Next, what is now my favorite pizza, came out. A piping hot White Pizza. The blend of Ricotta and black pepper set off by fresh basil transforms a straightforward classic into a wonderful treat for the senses. Just enough pepper to give it a zing! 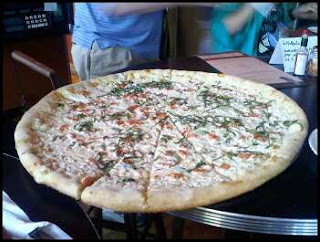 There was also a Hawaiian pizza that came out, with half of it also having jalapenos on it. It looked and smelled fantastic but I was dreaming of dessert already! I'd been told there was a Nutella Dessert Calzone on it's way out and I wanted to save room for it, as it sounded amazing. Soon, my dreams became reality! 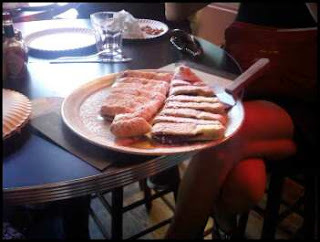 A Powdered Sugar coated calzone came out to join our little group and it disappeared quickly. Warm and gooey Nutella oozed out of this dessert to die for. Several of the calzones appeared and just as quickly disappeared off the tray.